Personal Details: Mary was the daughter of Michael and Helena McNamara (nee O'Brien), of Cambridge. 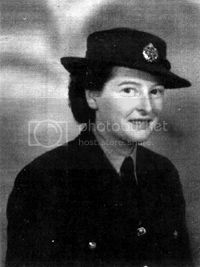 She was the sister of Cambridge airman Brian McNamara. Mary married Desmond Phillip McGovern of Cambridge. who had served in the Army in WWII. They had four children, Brian, Mary-Ann, Tim and Margaret. "She wanted to train as a Karitane Nurse, but was called up a few days before her acceptance for nursing arrived! She was in the Air Force (chosen because Brian was in the Air Force) for 3 or 4 years, based at Ohakea the entire time. She doesn't remember there being any other WAAF's from Cambridge being there at the same time as she was. Mum says off-duty life was very social. Pubs were out-of-bounds but she remembers going to a private party in an upstairs room at a pub in Bulls. At about midnight they were all asked to leave by the landlady (in dressing gown and hair curlers!) and she made them climb out onto the roof and leave via the fire escape so no-one would see them. When she went on leave, Mum would catch an Air Force plane that was going to Hamilton and then travel by bus to Cambridge to the family home in Williams Street. One time she remembers a special flight was ordered to fly 'wings' up to Hamilton as there was to be a parade the next day and there were none in 'Stores' in Hamilton. One of Mum's friends knew she had the weekend off so let her know about the plane and she managed to hitch a ride. Gwen Nickle was the driver who met the plane at the airport and Mum sat with her in the front and they chattered away much to the annoyance of the person conveying the parcel of 'wings'. Also Gwen took the long way round to Hamilton so she could drop Mum at the bus stop on the main road!! Mum had a lot of compassionate leave as her father was diagnosed with cancer and was very ill. She was on leave when service people were being demobbed, so she didn't go back. She picked up her discharge papers in Wellington, after her father had died and she and her mother were going on a visit to England and Ireland to see relatives (and take them lots of food, she said). They were on the first passenger ship to leave New Zealand after the war - the Rangitikei, and they returned later on the Rangitane." Thanks To: Mary-Ann Kane for her help in compiling these details.